A series of consultations brought the team together — clockwise from top: Jason Iverson, Teri Mason, Gina Wicker and Lauren Hunter — to determine fabric selections for above and below deck. LIVING THE CASUAL LIFE, AT LEAST IN THE PAGES OF THIS magazine, typically involves an outdoor space for a home like a patio, deck or sunroom, but sometimes a person's home - or second home - is less traditional. In this case, it's a sailboat. Even though there are some vast differences between living off a dock and spending time on a deck, many of the same elements go into producing a space that is livable and functional, and with fabrics that can stand up to weather, wear, entertaining and just day-today living. This exclusive two-part series details the makeover of Galatea, a 43-ft. Hans Christian sailboat, owned by internationally known photographer Steve Mason and his wife Teri. Here, the story comes to life including photos of the step-by-step process and interviews with the key folks involved. Next month's October issue will contain the big reveal. The redesign can also be followed on the blog, galatea.sunbrella.com. Heading up the project was a dedicated and talented crew which includes Gina Wicker, design and creative director for Sunbrella; Jason Iverson, exterior fabricator and owner of Iverson's Design, and interior fabricator Pam Tregoning, owner of Portage Canvas & Upholstery. Taking its name from Greek mythology, Galatea is docked in Olympia, Wash. Mason uses it not only for sailing expeditions to the San Juan Islands and Caribbean, but for his work doing photo shoots for companies like Eddie Bauer, Wrangler and Home Depot. Owner Steve Mason admires Galatea for her classic design, her line, and the way she looks on the water. January 2011, and one month later the team of experts was assembled. With everyone excited and on board for the makeover, work began last spring. The boat had a re-rig in April, at which time some additional exterior improvements were made. Fabrics were then finalized and shipped and the renovation was fully underway in May and June. The finishing touches were completed and the blog launched by July. This month, the boat makes its formal debut at the Boats Afloat show, Sept. 14-18, at Lake Union in Seattle. "For us, this project has been about lifestyle," said Wicker. "We looked for the right partner for this kind of renovation. We wanted someone who had sailing as part of their lifestyle, but who also understood the design aesthetic. What we want to communicate is that whether you're a boat owner or if you apply these methods to your home, Sunbrella is for the active lifestyle. It's low-maintenance and high-quality. It can be high-design, if you choose, or it can be simple and classic. It really is all about lifestyle and simplifying things so that you can enjoy your time when you're not at work, running kids to a ballgame or stressed out." Here's the thing about living on a boat - it helps you simplify things. Size and space dictate what comes along, and usually it isn't very much. For Mason, there is something wonderful about the efficiency of it. Iverson’s Design refabricated the dodger and created a bimini and an enclosure for privacy and protection. Great extras were added like a pocket inside the dodger for a fl ashlight — perfect for those dark nights out on the water. "I am a lifelong sailor," he said. "My resume for sailing is strong, but I had never owned a boat. The particular design we bought, Hans Christian, had always been one of my favorites; I loved the style and pedigree of it. But it was only after our kids moved on to college - because boats are a huge time commitment - that we decided to purchase this one. It is the first boat we have owned." Built in 1980, the blue-water cruising boat was purchased by Mason and his wife in 2003. Even as discussions began about the renovations, Mason wanted to honor the boat's classic lines, which are part of its charm, and he didn't want to take away from that during the transformation of either the exterior or below deck. "We wanted timeless and classic," he said. 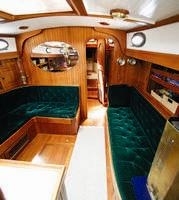 The sailboat's dark-green velvet interior, said Tregoning, is a well-known calling card of Hans Christian boats. "But it makes for a cave-like feeling as these boats have small windows letting in little natural light," she explained. "My thoughts were to use a fabric lighter in color that would be complementary to all of the teak which is extensive on Galatea." Sunbrella's Wicker was in total agreement. "The green velvet looked beautiful with the teak, but it delineated every space, creating more of a closed look," she said. "We wanted to go with a cushion and berth fabric in the same warm family as the teak so the space would feel larger. Some people live aboard - and Steve is doing that when he is in Olympia - so he'll want low maintenance. That means picking a fabric that has a little surface texture because it's a lot more forgiving than a flat color." A standard among Hans Christian boats, the green velvet’s texture prevents slipping and sliding, but makes the cabin seem smaller with its dark color. seating. Tregoning says she's seen plenty of boats in her line of work that are in need of an update. "The 1970s and ‘80s were the worst as far as choices of fabrics and colors," she said. "Remember Harvest Gold, Avocado Green and dark browns? Take these colors and add wavy stripes. That was done frequently on boats then. Yikes!" When the initial design consultation took place last May it brought the entire team together for the first time to discuss options, to page through the choices in the Sunbrella fabric books, and to sort through samples that had been sent to Mason and his wife the month before. "It is so difficult to get a sense of what something is going to look like with those little swatches," Mason said. "The biggest help for Teri and me was to get those swatches in foot-by-foot squares. When you get the fabric larger, you can see more of the detail. You can lay them around the boat, stand back and look at things from a distance, and then get a better sense of what it's going to look like." Larger samples in a variety of color families were requested in the following swatches: Canyon Wren, Canyon Vellum, Heritage Wheat, Sailcloth Sand, Sailcloth Shore, Terrycloth Heather Beige, Canvas Heather Beige, Holmes Flannel, Dupione Cornsilk, Foster Metallic, Linen Sesame, Spectrum Graphite, Baily Daffodil, Leigh Lemon and Nile Fossil. Once the green velvet and old foam were gone, Pam Tregoning’s work began — patterning to determine the boat’s contours and how much new foam and fabric were needed for the interior’s updated look. Choosing fabrics for the interior of a boat differs quite dramatically from selecting ones for your home, Wicker pointed out. "The spaces on a boat are very tight. And in a boat like Steve and Teri's it's a blue-water sailing boat. You can be out for weeks at a time and never come back to the marina. You can experience rough seas so one of the things you take into consideration in a boat makeover is pattern. You want to minimize heavy patterns because it can contribute to a feeling of seasickness when things get rough. You don't want something that is going to mess with your eyes." After that first meeting, Tregoning returned to Galatea with her CanVex patterning paper to measure the interior contours of the boat. "I prefer to pattern solo - without the owner present," she said. "As long as they leave the main switch on for lights, I can be in and out of there in a short amount of time. With Galatea, patterning took about four hours. Galatea has 22 cushions - some larger, some smaller - which is a medium-to-large project for us. Though with Galatea's classic styling and simple lines, we were able to focus on Sunbrella fabrics as a transforming part of the project." Meanwhile, the exterior of the boat required work. Galatea was moved up to Port Townsend, Wash., a large port harbor that is well-known for its craft smen and the work that goes on there, for a rerig last April. The standing rigging - the lines that support the mast - was showing signs of wear and tear. The revamped vessel makes its formal debut at the Boats Afl oat Show, Sept. 14-18, at Lake Union in Seattle. According to Mason, good rigging is especially important when you move off shore and are dealing with more powerful wind and waves. The rigging supports the mast or spars so it's a pretty critical element for a successful sailing trip. There's also the day-to-day weather and strain on this series of wires even when the boat is docked. Port Townsend Rigging completed the job in two weeks. At this time, another key change was made. Mason had the mizzen mast raised six inches to allow space for the addition of a new bimini top. 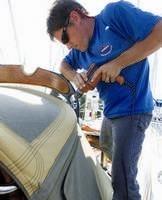 The boat was now in the hands of Jason Iverson, who refabricated the dodger and created a new bimini. Galatea already had a dodger - basically a boat's windshield - which consists of fabric over stainless-steel tubing. It is not a full enclosure. New for Galatea would be a bimini, another top further back in the boat, that provides shade. Iverson then fashioned a connector piece to fit in between the dodger and the bimini to create a complete roof line. With the installation of that converter piece and the zip-around panels, Mason would now have full coverage for both privacy and protection. "Galatea, being a ketch-rigged sailboat with a classic canoe stern, has several features that made our job a challenge," said Iverson. "For example, the design of the bimini had to reflect the curvature of Galatea's stern cockpit while remaining workable for the addition of enclosure panels." It was important to Mason to have a seamless flow between the interior and exterior of the boat. He and Teri looked at similar color palettes as they had for the interiors, and those same warm tones seemed just as appropriate for the Galatea's exterior. For the dodger, Mason and his wife picked Heather Beige, a neutral that would have worked effortlessly on Galatea, but Iverson, as he is known to do, wanted to push the envelope a bit. He wanted to go with the more textured look of a relatively new Sunbrella marine fabric, Silica. The final selection for the dodger, sail covers and bimini is Silica Sesame, a color whose warm color and natural texture make it the perfect complement to the boat's teak wood grain. The slub yarn effect gives it a homespun look befitting a classic like Galatea. The enclosure Iverson added was fashioned from Sunbrella View in the color Toast. The second part of the series continues next month in our October issue as we guide you through the exterior improvements, share the final fabric choices, and, finally, unveil the photos of this masterful marine makeover above and below deck - including one surprise before things were buttoned up.